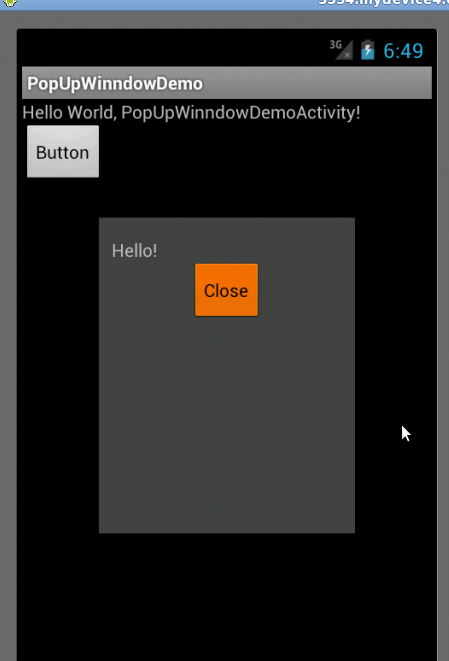 an idea , how to create a popup window with some text and close button. Great little tutorial! How do you dismiss the popup window with a tab on the side of the window instead of using a cancel button? It will cancel your popup on tab any where in window..
say for instance you were trying to have the pop up show up on the 3rd start of the app.. and it had 2 buttons on the buttom of the pop up - remind me later, and rate this app. How would you implement that? Please try my below post hope it will help you. Miral, You are regular reader on my blog. Miral this is a very simple code so please copy paste it from above. If you have difficulty please let me know..
if there is no way to do it then try to get device height, width and put instead of fix values..
How can i make and editText invisible in the pop up. I tried this but it doesn't work.. Worked very well. Thanks Manish. 2)You can Create ListView inside any layout and call this using inflate..
Can we add a popup window at a specific LatLng point? As pwindo.showAtLocation(layout, Gravity.CENTER, 0, 0); will display it on center. As I need to add muliple buttons on infowindow, the require infowindow contains 4 buttons but while implementing in infowindow only one click event works, as the infowindow appears on click of other infowindow, so getting many problems while implementing. 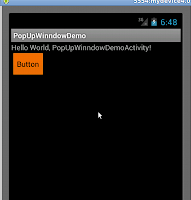 So i plan to add popwindow as infowindow on map if possible. Use Inflate layout with animation. left to right or how you want its up to you. means use inflator instead of menu, it will be same what you want..
1)Use Relative-layout how much possible. 2)Don't fix height, width hard coded, always use wrap and match parent. 3)Use 4 images for all drawable i.e.- drawable-ldpi,drawable-mdpi,drawable-hdpi,drawable-xhdpi. I have a gridview wit a few images.once i click the image i want the background to be a little blurry so that the image can popup.can u help me with this? Hi When i implement your code in 4.1.2 the onclick listener doesn't seem to fire and dismiss the window is this just due to the version or am i doing something wrong here? Great I like it you, because after solve your problem you reply back. it will help to other guys. I was looking into your blog and i'm the beginner in android! In view group u said R.id.popup_element, what is that actually?? Actually I am using LayoutInflater inflater here, it is used when you want add any other view inside your activity. so popup_element is the id of LinearLayout, screen_popup.xml. Very nice tutorial, short and fast, thanks!! can we make pop out appears on the next page after clicking the button? yes sure just create that popup on next page inside onCreate method(). above line is used here for close popup window.. I don't believe it. no one complain it yet. and me to using same code in many application. can you tell me which device you are using for testing? Have you tried it any other device? I hav to create a Popup using a background service.how can i do it.?? //here create a receiver which will call a intent for your popup. I have created many time and its working fine for me that's mean you are doing some thing wrong. Please share your code so i can find out reason. Have you tried? Is there any problem? and open different one for all buttons. I have done that indeed, only i changed private to public (to be honest i still don't know what the difference is). But i can open more pop up windows after i created pwindo1,2,3 etc. The only problem i am facing now is that the close button only works for the first pop up window and not for the second, third or etc.. But i can close them when i touch anywhere outside the box. Maybe you know why that occurs? Hey I just want a pop up dialog as a sms is received or i may trigger it with a timer. eg. if u have applock installed in ur phone and wen u instal a new app in ur phone then a dialog appears saying if u want to lock the app or not. will u plz help me wid the code. Hi dear, I want to show pop on activity start. (i.e without button click). How i can do so? Call your alert dialog on Create methdo. Nice one bro! thank you very much for sharing knowledge. I have one question, how can I adapt the width of the popup to 100% in window? Get the height width of your device using code and pass into new popup window instead of 300, 370. May I ask, how can I fix the position of button at the bottom? Sir can we create this popUp window on our homescreen when the app is closed!! I'm trying to get a pop up text box, with some disclaimer and app info at the start of my Android application's launch. Hi, I want to blur the image ,but particular part should be very clear.can i know the approach? please help me on this. Please check this error on stackoverflow, hope you are doing very silly mistake. Hello, if i need the pop up window to show full screen except that the height should be margin top 25% of the screen. So basically i need it full width but diff height and align bottom. Please how do i do that?